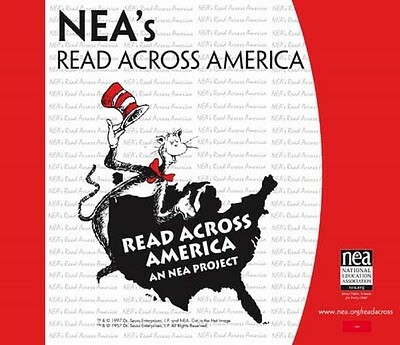 The celebrations start this week for Read Across America Day and Dr. Seuss' Birthday. The official day is March 2 but many places celebrate anytime during that week. This holiday is a wonderful way to encourage reading for young children. Our elementary school started a Readathon today with a Dr. Seuss theme. The PTA knew I was obSEUSSed so they asked if the Cat in the Hat could come visit during lunch to remind all the kids to be reading and tracking their minutes. 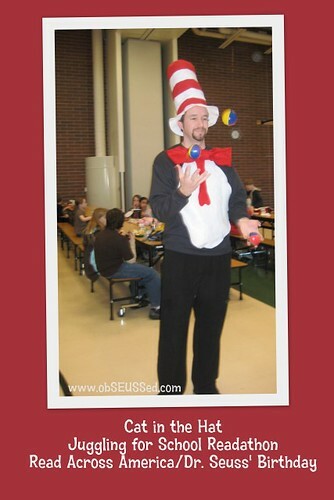 My husband was so great to jump in our Cat in the Hat costume and walk around the lunchroom juggling balls and talking to the kids. He was a great physical reminder for the kids to be reading this week. To see how I made this Cat in the Hat costume click here. 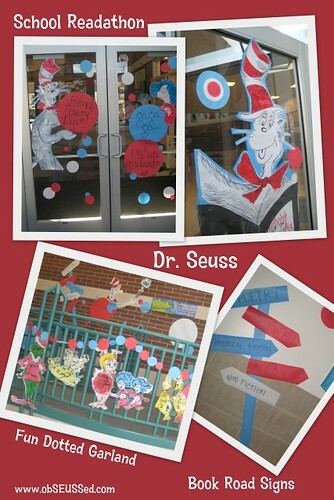 The PTA did a great job decorating the doors and halls around school with hand-drawn Dr. Seuss graphics. 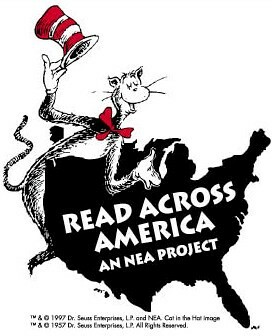 Read Across America to pledge to read with your child on March 2. 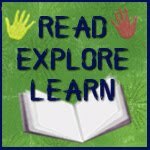 The National Education Association (NEA) has great resources and links for classrooms and libraries. Seussville has great printable activities and online games. You can also make your own 'Who' character. Target has Dr. Seuss story time and special Dr. Seuss books on sale for 2 for $10. 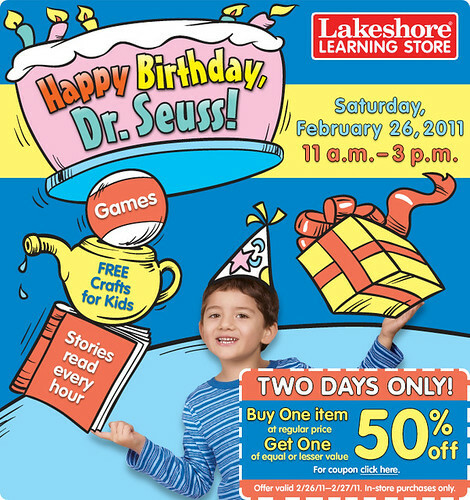 Lakeshore Learning will offer Dr. Seuss Craft time from 11:00 a.m. to 3:00 pm at many locations on Saturday, February 26, 2011. On Wednesday, March 2, PBS Kids is having a marathon showing 2 hours of "The Cat in the Hat Knows a Lot About That! ", including new episodes. Check your local stations for times. See the TV spot for this on PBS Kids. 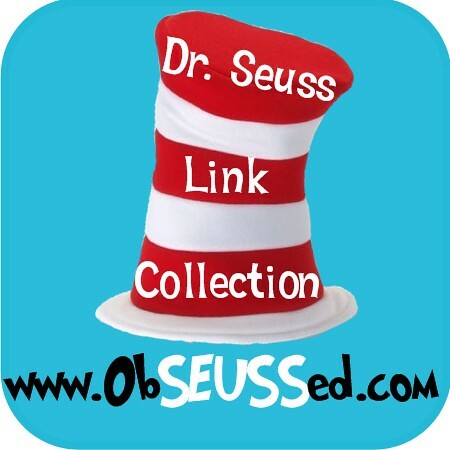 My Dr. Seuss Link Collection: Stop by the page tabs at the top of this blog for more links of Dr. Seuss ideas. Oh we love Dr Seuss! So much fun and great to see all this Dr Seuss activity! Hooray! I love Dr. Seuss. Thanks so much for sharing such great ideas to celebrate. I found you through a linky party. My readers would love this. I would love if you came and linked up to TOO Cute Tuesday! We went to the celebration at Target today. It was such fun! I featured your blog on my blog today so others may come here to find great Dr. Seuss ideas!! Wow your school went ALL out for Read Across America day, I love all the decorations put up by the PTA!